Puppies are so cute and playful! When we get a puppy, we want the very best for them. We want to love on them all the time and take puppy pictures of every cute thing they do at every moment. The obsession of their adorable cuteness takes our love to a new level. We are on a puppy high and the joy in our heart is pure and real. When a very young puppy, 8-weeks to 10-weeks, comes in to your life, you may think that you are all the puppy needs. There is no one who will care for and protect over this puppy more than you. This is all true, but when your puppy is provided an opportunity to meet new puppy friends, their tiny world grows and they experience magical puppy enchantment. Their world comes alive! And, at the same time of seeing their happiness, your heart cries because there is another moment of adorable cuteness which is bittersweet. As much as you want your puppy to enjoy their new play friends, you find it difficult to leave your puppy with someone else. It’s so hard to drive away from dropping your puppy off at daycare, even knowing your puppy is going to have more fun with friends than they will staying at home. What you may not know is they NEED this socializing time to become better adult dogs. The reality is puppies are pack animals because dogs are pack animals. I know it hurts saying farewell for a few hours. But your ability to help your puppy achieve good social skills, manners, and training is important for them as an adult dog even though it means they will leave your side from time to time to play with their friends. New puppy introductions are important and should be monitored by attentive people so your puppy is kept in a happy and safe state of mind. Their curiosity and wonder are fragile. They are new to this world and are taking in all kinds of experiences. Your role is to make sure those experiences are positive and safe. You need to ensure a clean environment. You need to make sure other puppies or small dogs have appropriate vaccinations. You need to ensure your puppy is not bullied by a more experienced dog who sees a submissive puppy. A puppy greeting other puppies is similar to full grown dogs. The instinct is within them. They should greet by smelling each other and approach with permission. Puppy socializing offers repetition of making new friends and learning helpful play styles with other puppies or other dogs. It’s adorable to see them make new friends. For puppies, you need to know when to allow dogs to interact and when to step in. It is so great for a puppy to learn proper dog etiquette. Only another dog can teach them dog etiquette and proper social skills. While learning what is right, your puppy will make mistakes and the other dogs will offer appropriate and necessary corrections. It’s all part of growing up and becoming a model citizen in the dog world. When corrected, it is important that the puppy stops and says, “Oh, hey, sorry man. Forgive me. Let’s keep playing. I won’t do that again. Sorry.” The other dogs are usually quick to forgive and play should resume. It is good to have a mild-mannered older dog in the puppy playgroup to offer wisdom to the young ones. Puppies benefit from learning play at a young age because they can have friends, go places, do things with you, and enjoy life to the fullest. A socialized puppy is easier to take out in public because they will make you proud by being friendly toward other friendly dogs they meet. Puppies do better when they self-regulate their play with moments of calming down. Puppies do tire out. Just like humans, puppies can become grouchy when they are tired. Puppies need rest. Their immune systems are very young and still developing. Rest is good to keep their health in check. When puppy play takes a break, you may see your puppy do a stress-reliever such as a shake off, or they will stop and scratch themselves, take a drink of water even if they are not thirsty, or seek out a quiet place by hiding under a solid object such as a chair or low coffee table. These stress releasers give the puppy a moment to regroup and push the reset button. A quick nap might happen right after you see this because puppies get tired easily, both physically and mentally. And when they are doing a shake off or scratching, they need a little break. Puppies need to learn to calm themselves in the middle of playtime so they don’t get short-tempered or over-aroused. Surprisingly, amped-up play time is closely linked to aggression. You do not want your puppy to deal with prolonged playtime by becoming aggressive in their play style. So, help your puppy to learn to self-regulate by taking breaks during playtime so the energy level can lower again. Parents should know when to step in if a puppy is being picked on by other dogs. If your puppy is constantly a target, then the group you are in is too experienced for your puppy. Seek out calmer playgroups so your puppy can learn in a positive environment. We believe Jane Killian with www.puppyculture.com offers some of the best ideas on raising well-socialized and well-mannered puppies. Check out her puppy training videos at her learning library. It is helpful for your puppy to meet several different types of people at a young age. If they meet all types of people, including people with walking aids, people with facial hair, people with hats, loud people, drivers of noisy vehicles and delivery trucks, tall and short people, young, old and everyone in-between, all walks of life people then your puppy should not be fearful of most people when they get older. They should also make a social visit to your vet’s office and groomers just to say hi and get treats. Make this easy and keep it positive by carrying some yummy treats with you, or even some of their kibble, and ask people to offer some to your puppy. This will help the puppy associate new people as a very positive experience. It is best for the human to slowly offer a hand for the puppy to smell. The puppy should never be forced to say hello or snuggle anyone. And even though your puppy is amazingly adorable, prevent him from being fondled too much until you can see your puppy is okay with the idea. The introductions should be on the puppy’s time and at their comfort level of acceptance. You could sit at a coffee house patio and there will be a few people who will naturally come over to say hello. Encourage this because when your puppy is older they will or should be more accepting of random people they do not know. Extra time is required with shy puppies. Get down on the floor and expect to be there at least ten minutes until the puppy comes to you on their own. Treats or kibble could be a good lure. Offer gentle praise and maybe lightly and slowly touch the puppy to affirm that there is no threat. If you have another person with you, try rolling a ball slowly between the two of you so the shy puppy focuses on the moving toy and not the scary humans. If you are trying too hard to make the shy puppy accept other people it will probably backfire. A puppy warms up to others at their own speed. It can’t be rushed. Never force them to do something they are not comfortable with. Repeating experiences helps puppies to become familiar. You might repeat a place, a sound, a walking path, a location, a training command, another dog, another home, etc. Puppies remember good experiences as safe which helps them link that experience and build confidence each time it is repeated because they’ve done it before and they remember it as good so repeating it will be good. If you have a friend who also has a puppy see if you can meet them on a regular basis. It is fun for puppies to play together! Doggy daycare is also an option for puppy socializing. 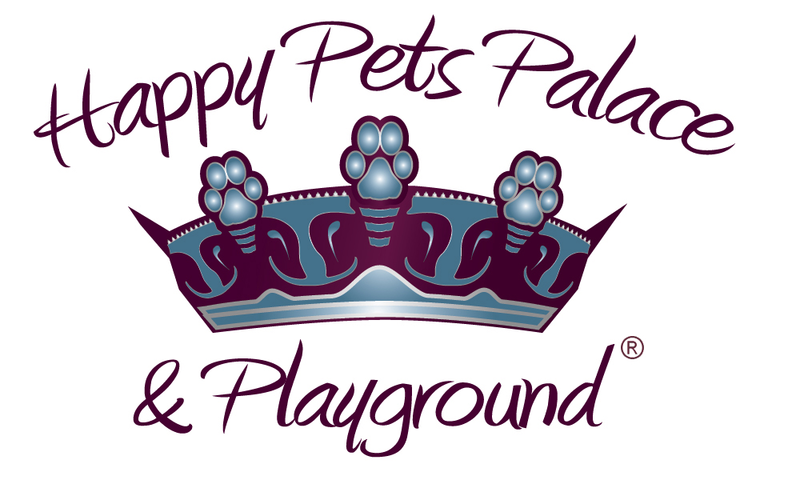 Happy Pets Palace provides a neutral territory and is puppy proof. Most people have jobs and chores to tend to. Puppies love to help with chores, but they usually make the job take a little longer. It is difficult to try to tire out a puppy or a dog who has lots of energy. Daycare offers an option for puppies to play with other dogs in a supervised and air-conditioned environment. After daycare, your puppy will be tired out and so restful so you can snuggle them to your heart’s content. Daycare offers everyone a day out. Every other Saturday, Happy Pets Palace offers a free puppy social hour, for puppies 9-weeks old to 7-months old, where parents stay with their puppy to help them feel safe while meeting other puppies and people. It is a fabulous way to see first-hand how your puppy becomes familiar with playing with other pups. We have toys to play with and room to run. Puppies engage in all types of play while being able to check in with mom or dad for reassurance. It’s nice to be able to offer this service to the community. We know these puppies will be better off as adult dogs from having these experiences in a safe and clean environment. American Veterinary Society of Animal Behavior (AVSAB) says, “during the first three months of a puppy’s life, they should be exposed to as many new people, animals, stimuli and environments as can be achieved safely and without causing overstimulation manifested as excessive fear, withdrawal or avoidance behavior. In general, puppies can start puppy socialization classes as early as 7-8 weeks of age. Puppies should receive a minimum of one set of vaccines at least 7 days prior to the first class and a first deworming. They should be kept up-to-date on vaccines throughout the class.” We agree with AVSAB.org and have seen first-hand the benefits that puppy socializing at a very young age offers. We do however require the vaccinations to be from a licensed vet, then wait 7-days. We also require clean results of a stool sample done by a vet showing the puppy is clear of any parasites, worms and Giardia. Read more about ASVAB’s position statement on puppy socialization. Dr. Ian Dunbar, a veterinarian, animal behaviorist, and dog trainer, has studied and trained dogs since the early 1980’s. He confirms there is a short window of time that makes a puppy a great dog by supplying that puppy with positive experiences and enrichment of new elements. “The socialization process is deceptive because all puppies appear to be Mr. or Ms. Sociable at two, three and four months of age and so breeders, veterinarians and owners are unaware that anything is amiss. People are duped by their puppy’s confident and friendly demeanor, not realizing that the effects of insufficient socialization will not become apparent until later in life. But by then of course, it is pretty much too late for quick, easy and effective rehabilitation.” Read more here. A puppy’s window of opportunity happens at the puppy’s youngest age, within the first twelve weeks. You can shape your puppy’s future early and it will impact them well into adulthood. Prior to three months old they are a sponge taking in a great variety of stimuli and experiences, thinking this is how life is, and it’s okay. They are tender beings and so ready to embrace life with love and acceptance. We hope you join us at one of our puppy socials soon. It is a wonderful way to help your puppy become a better socialized dog to share a more enriched life with you. Here is a quick 3-minute video discussing the benefits of early puppy socializing.